Red pants are one of my favorite things to wear - and they are one of those items that always get compliments. (And, it really makes my day when someone tells me that after seeing my red pants - they went out and bought some!) 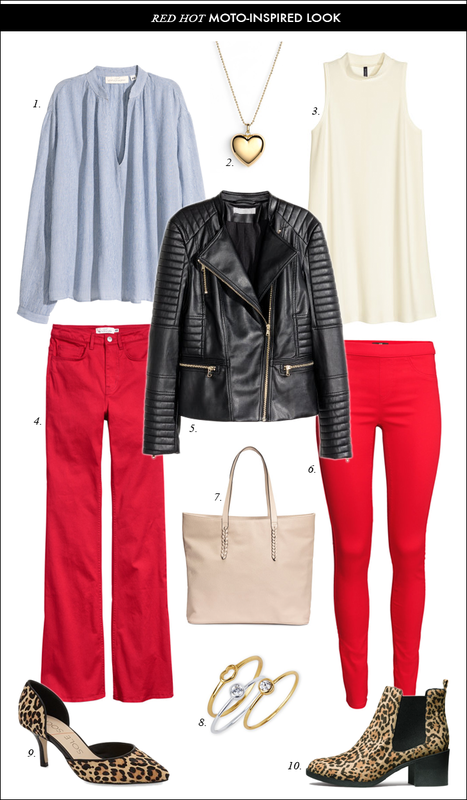 I have styled red pants two ways - mixing in budget-friendly pieces. The top on the right is actually a dress - but I am styling it like a longer tunic because it's best to wear a longer top with leggings. Everything shown is under $100, and mostly around $50 - including the biker jacket that is $60. Also, LOFT just declared this month - FIREBALL RED - which they have the perfect shade of red, in my opinion. I picked a utility blouse and cardigan in that color last year - and I love it! Perfect for Valentine's Day. NYFW starts today! One dream of mine would be to attend Fashion Week, particularly the Fall/Winter shows in February. Winter clothes are my favorite - and those runways shows are always the best. A few shows I would like to attend would be BCBG Max Azria and Prabal Gurung. Love both of these looks, that moto jacket is such a great piece! I also want that pretty heart necklace, enjoy your weekend Lisa! Thanks, Marta! Hope you have a great weekend. How fun that your red pants are your most complimented! I did have a pair for awhile and they were definitely attention getters! As usual, love these outfit sets! Red pants are fun! The leopard is a great choice. You styled both options so well. I love red pants! Unfortunately my favorite pair shrunk when I put it in the dryer and my other pair doesn't fit me at the moment cause I gained too much weight. UGH! Thanks, Amy. I hate it when I shrink things in the dryer - I have lost some favorite things like that, too. That jacket is seriously fab!! Loving the red trousers, lady! Too cool! Love the red and leopard mix, so festive and holiday appropriate! Feel free to stop by my weekly Weekend Wear linkup tomorrow (and every Fridays) to share your lovely styles. Thanks! I will stop by. Thank you so much for featuring my outfit! Love the two outfits you styled with red pants. They are great year round, but especially for Valentine's Day! You are welcome! Thanks for joining the link up, Laura! That moto jacket such a good deal! As always great collages. You make me want to throw caution to the wind with the budget and go wild and get everything! I have been wanting a pair of red pants for a long time now and just can't seem to find the perfect pair/fit. I love leopard mixed with red! I found mine at LOFT a few years ago - but most of the time finding a good fit on pant/jeans fit is a struggle for me. The leopard print looks really sharp with the red trousers - great combo. The red pants are so stunning!! The perfect combo with the jacket! Omg so cute!! I need those red flares and leopard print booties! Both looks are fab and so festive! I'd love to add a pair of red pants to my closet! Any excuse for red pants I am down with! Look at Laura and our very own Alison! Lovely looks. Lovely ladies. Well chosen, my friend. Guess who jumped off the shopping ban train last night? Oh, yeah, guilty as charged, your honor. Bought a moto! Woo hoo!!! Can't wait to see the moto styled on your blog! Thanks, Leslie.